Getting current machines to play nice with AppleTalk is possible, but painful to setup directly, or working through a bridge machine. 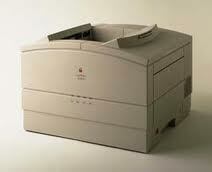 Fortunately with OS 9.22 on my Bondi Blue iMac I was able to find the printer via Chooser (the printer was called “loaner”) , but I wanted to be able to print to it from my main machines, which are running OSX 10.4, 10.5, 10.6 and 10.8. A quick search confirmed the availability from Apple (go to “Printing Software Downloads” at Apple’s “older software list“) of a MOS9 version of the printer utility, which I downloaded and installed, and when run on the iMac, I was able to change the IP address to a matching 192.168.x.x address, and changed the name from”loaner” to “LaserWriter”. Adding the printer to my laptops and desktop machines was easy as, and whamo! Brand new old laser printer on the network for all to use. Print quality is good, and as it uses the same Canon engine as the HPLJ4/5 range, cartridges seem to be still available at reasonable prices. 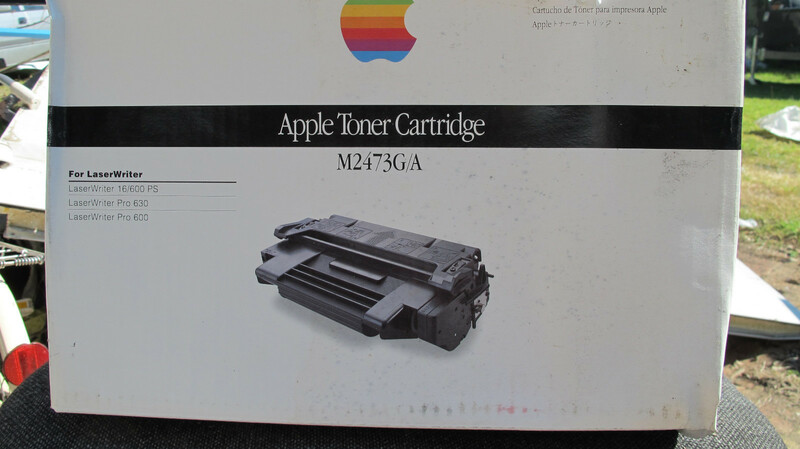 For a 1994 printer, I think it has some good years ahead of it. Moving forward to a more recent time (September 2013), the LaserWriter has been sitting dejected and unused for several years as I hadn’t bothered to update the IP address on it after several network changes. Sorting out dramas with inkjet printers not printing because they’d dried up from not being used, I needed a quick fix to get a couple of documents printed. Jumping back onto the iMac, I was able to see the LaserWriter via AppleTalk, and quick change of IP address, and it was back on the network for my MacBook to see. All good? Of course not. First test page printed, and there were repeating marks down the left edge of the page. From the interval between the marks I guessed it was the fuser roller. Yep, there were matching marks on the fuser. Closer examination of the toner cartridge that came with the printer, and it looks to be a re-manufactured one, and I’d never had good experiences with re-manufactured cartridges. 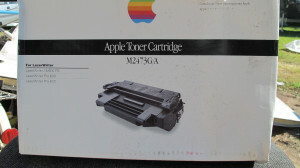 So, on to eBay in search of a new toner cartridge, and plenty of new HP ones available, but were a tad pricier than I expected. For a laugh I then searched for 16/600 toner and was surprised to find a local listing, starting at $1, and that was the sale price I paid. All in all, another device saved from becoming “e-waste”. Apple EDVT for the Ethernet Adapter Card “2014 Winter Warmup”?